To be successful in the changing healthcare environment, pharmaceutical companies need an honest self-assessment. Is the board prepared for the future? Does it have the right structure, mix of skills and experience required to steer the company most effectively in the years ahead? The driving forces behind healthcare in general, and the pharmaceutical industry in particular - technology, demographics, consumer expectations and affordability, have been challenging and enduring over the past few decades. Yet the current environment has brought accelerating change and complexity, and by implication, pharma companies need to look for innovative new approaches and cutting-edge strategies for success. Recent global research undertaken by Russell Reynolds Associates (RRA) examines the questions of whether the board leadership of pharma companies is in the best position to face current and future challenges and what the best ways to enhance board effectiveness are. The study is based on an analysis of the board composition of the top 15 pharma companies and their 180 board directors, but the findings and insights could be applicable to a broader range of companies in the pharma industry and in healthcare in general. Enriched by a series of interviews with executive and non-executive board directors as well as ongoing consulting to the pharma industry at the most senior level, five categories of insights into board structure and composition can be deduced. Pharma boards are performing - and need to perform - an increasingly vital role in debating and challenging company strategy. Yet many directors of major public companies indicate that issues relating to governance and financial risk still seem to take up excessive amounts of the agenda and time in board meetings, leaving insufficient opportunity to discuss and debate strategy and innovation. An effective board empowers a company to develop and execute robust strategic responses to arising and enduring challenges. Three elements will be important in defining a board's effectiveness - corporate strategy (clarity, alignment, contribution), composition (competencies, diversity, both individual and collective board performance) and structure and processes (committees, meeting mechanics, agenda). These three elements are bound together by board culture, characterised by mutual respect, collaboration and transparency as well as an open and independent mindset, constructive challenge, licence to dissent and performance orientation. Boards need to prioritise the challenges and prepare specific, actionable recommendations for enhancing each of the relevant areas. A benchmark against competitors and leading regional and global companies is also highly recommended. In response to particular threats and opportunities, the boards of pharma companies must be able to bring a diverse set of competencies, experiences and perspectives to bear. Board members need to understand the current challenges and be able to steer both strategic development and company transformation. It is unlikely that changes in board composition will be either revolutionary or dramatic - but we will surely see evolutionary change. 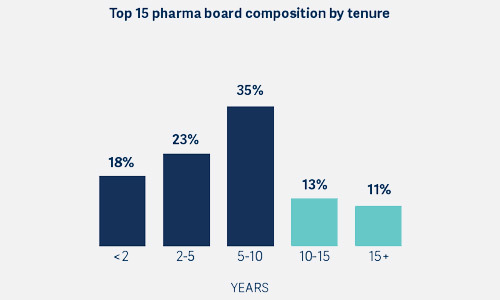 A closer look at the current board composition, especially the age of individual board directors and their tenure on their board, suggest that 20-40% of pharma board seats could turn over in the next few years. This is an opportunity for pharma companies to create more diverse boards - ones that reflect the changes in the environment, the global patient base and embody a wide range of skills. In this context, there is a need to increase gender diversity further, as well as to extend the talent-sourcing pool for board directors to further geographies, particularly for US-based pharma companies. Crafted with insights from regular director and board evaluations, they need to plan future board composition well in advance. For this, they need to define future requirements and skill gaps in the current board, and focus on the required capabilities, experience and perspectives to provide effective corporate oversight and governance. Digital initiatives will radically change the way pharma companies conduct their business. Yet, with some exceptions, the industry has been relatively slow to recognise the importance of digital opportunities to its future, including the vital contribution to its relationships with payers, physicians and patients. Pharma companies will need board members who can tackle not just the 'why', but also the 'how' of developing powerful, sophisticated data analytics and using social media to reach the patient community, to name just a few key areas. Currently, 40% of top pharma companies have one or more board directors with digital or technology experience. 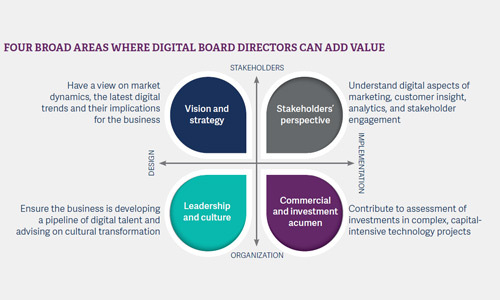 This is still more than the average across all sectors, but in order to challenge the leadership team and help it capture the growth opportunity through digital expertise, pharma boards would need to appoint more board members with appropriate digital experience. There is a strong feeling among directors that overall board make-up has evolved too far from successful innovators and business leaders who are steeped in the industry. In fact, only one out of five board directors (22%) has some previous operational experience in the pharma industry. 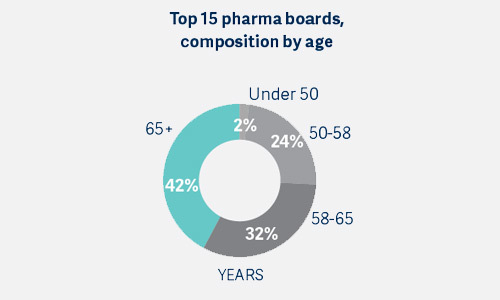 Other backgrounds well represented in pharma boards are academia (27%), financial and professional services (19% and 16% respectively) and consumer goods and services (13%). The vast majority of board directors, nearly two-thirds (63%), have previous general management experience, and nearly half (48%) have previous or current CEO experience of a commercial, for-profit company. In terms of scientific acumen, while there is a relatively high proportion of broad scientific capability on the pharma boards, it is primarily offered by academic scientists (16% of board directors in the sample) rather than by experienced pharma-sector R&D professionals (7%). There is a call to reinforce the board with hands-on pharma and commercial expertise to advise the executive management team on both strategy and implementation. Reassuringly, board appointments in the last year show a greater number of seasoned commercial leaders from within the pharma industry - primarily, with a general management or CEO background, followed by industry-specific R&D experience. Pharma companies have realised for some time that their previous strategies for extending into non-traditional, emerging pharma markets have not always been successful and need to be revised, with input from leaders with successful track records in those markets. 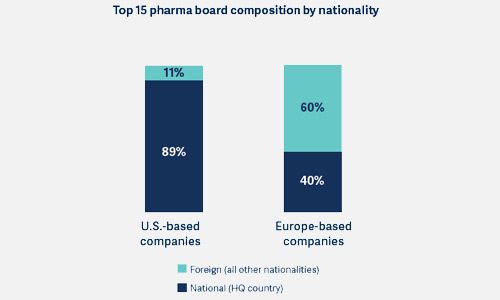 Current board composition at the top pharma companies shows that on average 22% of board directors have some operational experience in emerging markets. Just under half (40%) of top pharma companies have three or more board directors with operational experience in emerging markets. These directors can help guide the company in optimising talent strategies and extending talent pools, from the board level to country heads, in emerging markets. They can also advise the executive management in establishing an appropriate skill set by defining specific competencies required for success in an emerging market, determining competency gaps and tailoring the talent strategy accordingly. These five insight categories, highlighted from interviews with current board directors, provide a number of strategic action points for the boards of pharma companies. However, another insight should also be emphasised - the industry is moving rapidly towards a closer relationship with its end consumer, the patient. Although doctors have traditionally acted as intermediaries, in today's market, patients are becoming more active in their own diagnoses and treatment plans. As a result, consumer outreach is taking on increasing strategic importance for pharma companies. 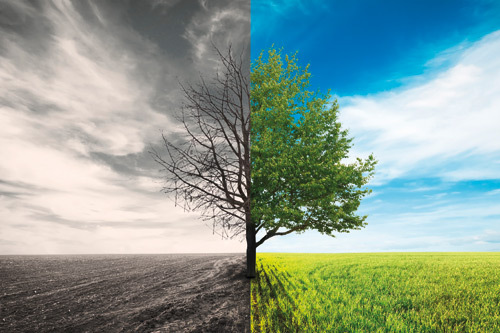 Pharma companies, and in particular pure pharmaceutical groups, have a growing need to understand the patient perspective. Boards have an increasing requirement to recruit members with successful consumer goods and services leadership experience. This, along with the other skills and experience noted above, will help to create a truly diverse board, ready to take on the issues inherent to today's increasingly complex and challenging pharmaceutical market.